A full service restaurant is defined as a sit down eatery where food is served directly to the customers’ table. These establishments may sell alcoholic beverages; provide takeout, delivery or present live entertainment. The term “full service” can encompass anything from a family-style eatery to an elegant restaurant; from casual dining to fine dining. Every person whose turnover in the preceding financial year exceeds Rs. 20 Lakhs / 10 Lakhs are mandatory to take the registration under GST Act as per section 22 of the CGST Act, 2017. If the person whose turnover is not exceeding Rs. 20 Lakhs / 10 Lakhs, then even he can also voluntary apply for registration under Voluntary Registration Scheme. Any taxable person who are currently running the Restaurant business and whose turnover in the preceding financial year is not exceeding Rs. 1 Crore / 75 Lakhs, then he can apply for registration under Composition Scheme. Restaurant Service providers are the only service provider who are allowed to take the benefit of Composition Scheme. Simply quarterly filing of returns. You cannot take the input tax credit on goods or services used to provide the output services. Not able to issue the tax invoices to person who are registered under Normal Scheme. Restaurant Service Providers who are registered under composition scheme are liable to pay tax quarterly at the rate of 5% of the turnover of the company. Mention the words “ Composition taxable person” on every notice board or signboard displayed at the prominent place at his every place of business. As per Section of 17(5) of CGST Act, 2017, the registered taxable person is not allowed to take input tax credit on supply of goods or services relating to food and beverages, outdoor catering except when such inputs and input services has been used by the registered person in outward supply of goods or services of the same category. Every registered taxable person who are providing Restaurant Service are required to file the FORM GSTR 1 (Outward supplies), GSTR 2 (Inward Supplies), GSTR 3 (Complied Return) and GSTR 9 (Annual Return). If the turnover of the taxable person exceeds Rs. 2 Crore, then the taxable person have to get its account audited by the Chartered Accountant and file the audited annual accounts and reconciliation statement along with the Annual Return. SAC Code is 9963, which will be mentioned while issuing the tax invoice to the recipient of services. Value of supply of services in a case of Restaurant of Services on which gst will be calculated is the price actually paid or payable to the supplier for the supply of Restaurant Services. The value of supply includes any taxes, duties, Cess, fees and Charges levied under any law for the time being in force, any incidental charges including commission and packing charges or any other charges made by the supplier on the behalf of the recipient, any expenses which should be bear by the supplier and it is paid by the recipient of service, any interest and late fees on account of delayed payment shall form the part of the value of supply of services. Place of supply of restaurant and catering services, personal grooming, fitness, beauty treatment, health service including cosmetic and plastic surgery shall be the location where the services are actually performed. Service Charge levied by the restaurant is also considered as the part of the consideration of supply and GST shall be calculated on it. It is also clarified that Service Charge is not a Statutory Levy. It is not levied by the Government (CBIC FAQs). 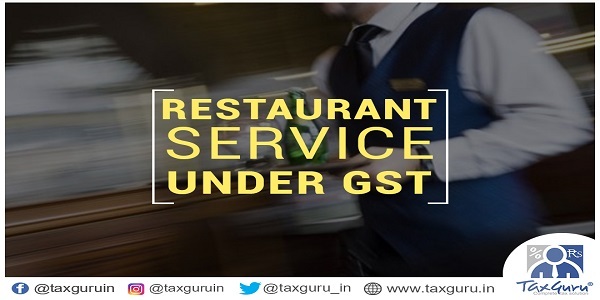 If the registered taxable person providing GST for Restaurant Service serves both alcohol and food both, then tax invoice shall be generated to calculate GST on food and a bill of supply or any other invoice as may describe in VAT laws for alcohol. Alcohol is non GST item and State VAT is calculated on the value of Alcohol (CBIC FAQs). Can a restaurant levy GST @5 percent on the billed amount and show it separately in the bill.If yes, under which provisions ?